Welcome everyone to my 12th Day of Christmas Sales! I am finishing off the last day with my newest 27″ Bru 13! I finished this beautiful Bru 13 today! She was made from the VL-7 Virginia LaVorgna head mold. She is perfection at its best.The artistry is superb with wonderfully detailed and shaded French eyebrows, beautifully spaced eyelashes, perfectly shaped lips with accents, and a hint of lavender eye shadow. Her porcelain head is on a FB-21.5S composition body from New York Doll Products. She stands 27″ tall but allow 32″ of shelf height space to accommodate the bonnet (total height in costume 32″). She has beautiful blue-grey Hand English paperweight eyes with intense depth. She has a striking blonde human hair curled wig with bangs from Global Dolls Company. The metal base doll stand is included. Her exquisite costume was created by me from a Lorna’s Lovable Dolls pattern. Layers of beautiful mauve dupioni silk, cotton laces, and silk ribbons come together to create the perfect costume for this beautiful antique reproduction Bru 13. She has a cotton slip and pantalettes with cotton laces and a beautiful bonnet decorated with antique flowers and silk ribbons. She has cotton stockings and handmade leather shoes by Pam Willits. Her regular price is $1495.00 plus shipping. She is on special right now for the “Twelve Days of Christmas Sales” through December 22th, (four days only)for $1295.00 plus shipping. Only one available, this costume is a limited edition of ONE! It will not be duplicated. Layaways are available on this doll. You will need to contact me at landofozdolls@mchsi.com or phone me at 815-565-0024 in order to receive the correct pricing. I hope you enjoy seeing more photos of this gorgeous Bru! I hope you have enjoyed my 12 Days of Christmas Sales! Thank you so much for looking! Merry Christmas and Happy New Year! Talk to you all soon and don’t forget Bleuette’s are coming this week!!! It’s the 11th Day of Christmas and this is what’s on sale! For all you Bleuette “Lovers” Monique Trading has just introduced a brand new shoe that will fit the wooden Bleuette body. Isn’t this just adorable? See the little kitty face on the toe of the shoe? They are called Kitty T-Strap Shoes and come 38mm long by 20mm wide. The colors available are White and Black, Black and White, and Red and White. Order yours now at the sale price! The regular price is $8.00 a pair and I am offering them to you as my 11th Day of Christmas Sales for $6.50 a pair. I will be ordering them in the next couple days and am taking pre-orders right now at the sale price. I had such a great response on the #733 Girl’s Dress Shoes I am restocking these and taking orders for more at the sale price until December 20th ONLY! The #733 Girl Dress shoes are regularly $7.00 on sale for $5.00. Order your Bleuette shoes now by emailing me at landofozdolls@mchsi.com or phone me at 815-565-0024. Attention Bleuette Collectors: I am currently painting Bleuette’s this week, I have a couple of orders I am trying to finish and am painting three extra dolls. I am hoping by Friday to have three Bleuette’s up here on the website for sale! If all goes well I will have two Premiere Jumeau Bleuette’s and one Bellette Jumeau 1907 for sale. Keep watching! Bleuette’s are coming! This beautiful Bru 13 was made from the VL-7 Virginia LaVorgna head mold. She is perfection at its best.The artistry is superb with wonderfully detailed and shaded French eyebrows, beautifully spaced eyelashes, perfectly shaped lips with accents, and a hint of lavender eye shadow. Her porcelain head is on a FB-21.5S composition body from New York Doll Products. She stands 27″ tall but allow 30″ of shelf height space to accommodate the bonnet (total height in costume 30″). She has beautiful brown Hand English paperweight eyes with intense depth. She has a striking blonde mohair curled wig with bangs from Dollspart Supply Company. The metal base doll stand is included. Her exquisite costume was created by Lorna Yates of Lorna’s Lovable Dolls. Layers of beautiful peach dupioni silk, cotton laces, and silk ribbons come together to create the perfect costume for this beautiful antique reproduction Bru 13. She has a cotton slip and pantalettes with cotton laces and a beautiful bonnet decorated with flowers and silk ribbons. If you are looking to add an exquisite antique reproduction Bru to your collection this may be the one for you. Please do not purchase this doll through her sale page as it will not give you the sale price. You will need to contact me at landofozdolls@mchsi.com or phone me at 815-565-0024 in order to receive the correct pricing. 6th Day Of Christmas Sales! This Is What’s On Sale! Welcome to my 6th Day of Christmas Sales! Today I am offering my CD Workbooks at a reduced price from now until December 20th, 2018. 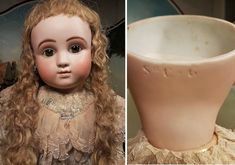 Learn to paint beautiful antique reproduction and modern painted eye dolls with the help of my complete step by step photos and written instructions. I currently have three different CD Workbooks available. I have “Creating the Perfect Bru”, “Creating a Tete Jumeau”, and “April” In-Depth Eye Painting (Blue Eyes). The set of three is regularly priced at $100.00 for the set. It will be on sale until December 20th for $90.00. I will also be selling them individually right now for $35.00 each. Regular sale price here on my website is $45.00 each. If you have a difficult time making it to seminars, let the seminars come to your studio and guide you through the steps of pouring, eye-cutting, soft-fire greenware cleaning, and china painting your Bru or Jumeau. 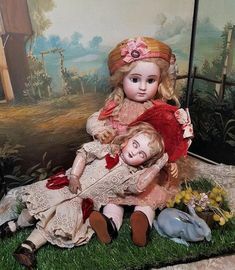 I will guide you with step by step photos through the entire process of creating a beautiful heirloom antique reproduction doll. The Bru CD Workbook has been written for the 30″ CDW 201 Bru 14 and the 28″ VL 7 Bru 13. The Jumeau is using the Tete Jumeau as an example. The CD Workbooks are step by step comprehensive photos and directions put on CD. They cover the complete process from eye-cutting thru soft-fire greenware cleaning, and all the china paint firings. The CD Workbook requires a pdf reader on your computer to open it. (This is not a video) You may study and paint from the clear concise photos on your computer or print off the workbook for a hard copy. Please realize the clearest photos will be on your computer. If you have a difficult time making it to seminars, let the seminars come to your studio and guide you through the steps of pouring, soft-fire greenware cleaning, and china painting your April. 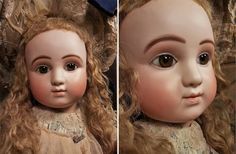 I will guide you with step by step photos through the entire process of creating a beautiful heirloom modern painted eye doll. This CD Workbook has been written for the 19″ April doll from Expressions. I will be doing blue eyes on this doll. This CD Workbook is 110 full-color pages of step by step comprehensive photos and directions put on CD, of the complete process from pouring the head mold, soft-fire greenware cleaning, loading the bisque fire kiln, thru all the china paint firings and doll stringing assembly. The CD Workbook requires a pdf reader on your computer to open it (This is not a video). You may study and paint from the clear concise photos on your computer or print off the workbook for a 110 page hard copy. Please realize the clearest photos will be on your computer. I am now also offering online classes that use the CD Workbooks as an aid in the “live” classes. New sessions will be starting in January. After the first of the year I will be publishing more information and a schedule here on my upcoming classes and how they work. It is wonderful to be able to sit in the comfort of your own home and learn porcelain doll-making. To receive the special pricing of $90.00 for the set of three or $35.00 each until December 20th you must email me at landofozdolls@mchsi.com or phone 815-565-0024. (Paypal invoice or credit card sales are available). The website will not give you the sale prices. You may also request the CD Workbook’s as a download and have no shipping costs. Shipping will be $8.00 for a small priority flat rate box on any purchase of CD’s shipped whether one, two or all three are purchased together. Below are photos of dolls that I painted as samples during the online classes using the CD Workbooks. Give the gift of doll making knowledge to yourself or someone else this Christmas! 4th Day of Christmas! Look at What’s on Sale! It’s the 4th day of Christmas and look at what’s on sale! THIS DOLL HAS BEEN SOLD! This little “Googly” will make a great addition to your reproduction collection. They are such fun little dolls. Her straw hat is awesome. Check out some of the closeup photos of it below. It was the 2nd Day of Christmas and this is what’s on sale! This Doll Has Been Sold! This beautiful 19″ April with blue painted eyes is a true work of art. She has an all porcelain body. April was originally sculpted by Dianna Effner and made from a mold available through Expressions. Her exquisite smocked costume was crafted for me by Sue Sharp of the The Sharp Needle. April stands 19″ tall but you need to allow 21″ in height on a shelf to accommodate the bow. She is wearing a yellow print cotton dress with a hand smocked cotton pinafore. She has a cotton slip and underwear along with yellow shoes and cotton stockings. I have been painting and teaching lifelike modern painted eyes for over 15 years. It takes numerous firings to achieve the depth as shown in these painted eyes. From the photos you can see this doll is painted to perfection with a lifelike realistic expression. 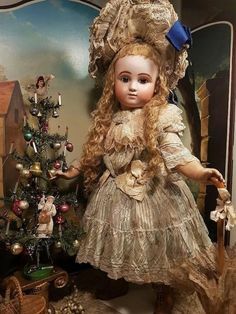 The regular price on this doll is $550.00. For the Christmas sale she is reduced to $495.00 plus shipping. Sale ends December 20th. I am not including a shopping cart button for this doll as I only have one. Please email me at landofozdolls@mchsi.com or phone 815-565-0024 if you are interested in purchasing her and I can send a Paypal invoice or you can call with credit card info. The “Twelve Days of Christmas Sales” Are Starting! See What’s On Sale Today! Welcome to my “Twelve Days of Christmas Sales”!! This is Day One! Every day from now through December 18, I will be offering an item or items on sale for your Christmas pleasure. The items will remain on sale through December 20th or whenever the items are sold out, whichever comes first. Some items I will have multiples of, but many will be limited to one. I will not be including shopping cart buttons for these items. I do not want to take a chance on selling them more than once. The item will go to the first person who emails me and wants to purchase the item. Once the sale is confirmed I will send a Paypal invoice or you can call me with a credit card. So get ready! Here goes! First Day of Christmas: 24″ Father Christmas Ready to Costume! This 24″ Father Christmas made from the Kimple mold was completed in 2008. I’m sorry to say he never was finished with costume so I have decided to offer him for sale as an undressed doll. He stands 24″ tall and is complete on his cloth body with the under robe and metal doll stand. I do not have a costume pattern to go with him. He has a beautifully painted porcelain head with beard, bisque hands and painted brown boots. Father Christmas has blue painted eyes. Completed with a traditional Father Christmas robe he will make an awesome addition to anyone’s Christmas collection. He will be my one and only offering of this size. I lost this mold in the storage unit fire of 2012 and was never able to replace it. He is a one of a kind offering from me. I do however still have the large size Father Christmas mold from Kimple that I offer soft fired greenware and blank bisque. On the 11th Day of Christmas…… This is What’s on Sale!!!! 36 Hour Sale!!!!! On the 10th Day of Christmas….. This is What’s on Sale!!! Finally, I am caught up with my Christmas Sale Days! Only two left after this one! On the 10th Day of Christmas….. This is what’s on sale!!! This beautiful Bru Jne R Painted Head only with glass eyes and earrings. Regular price is $295.00 on sale now through midnight New Year’s Day, January 1st 2015 for $195.00 plus $10.00 shipping to continental U.S. International shipping is available. She has a 13″ h.c.and can be placed on the FB19S composition body, not included in price but I can get one for you from NYDP at a special discounted price. She will make around a 23″ to 24″ doll when completed on a body. Mohair or human hair wig is not included but I do have some available for purchase. The wig and draping is only to give you an idea of what she will look like completed. If you have any questions or to purchase please email me at landofozdolls@mchsi.com . Merry Christmas! On the 9th Day of Christmas……. This is What’s on Sale!!!!! Yes, I am still catching up on my sale days, only one more to go! On the 9th Day of Christmas…. This is what’s on sale! This little undressed 8″ K&R 114 on a wooden body is regularly $195.00 and is currently on sale for $150.00 from now until midnight December 25th with FREE Shipping to continental U.S! International shipping is available but not included in the free shipping. 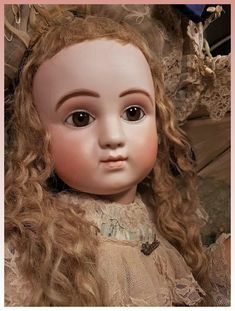 She has an adorable little light brown mohair braided wig and painted eyes. An adorable small cabinet size doll with the change of a wig can also be a boy doll. She also makes a great size for a large doll to hold. Please email me at landofozdolls@mchsi.com if you have any questions or are interested in purchasing.Merry Christmas!